This 25-person Contractor’s First Aid Kit is waterproof and housed in a plastic case. Contents are kept clean and dry, so it’s ready for use whenever the need arises. 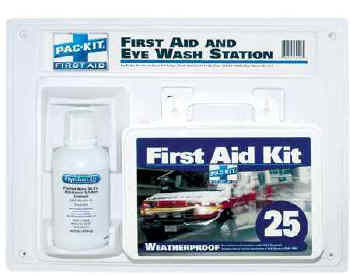 A 16-ounce bottle of eye wash flushes out dirt and debris with its sterile, isotonic buffered solution. Case measures 18"L x 14"H x 3 1/2"W.